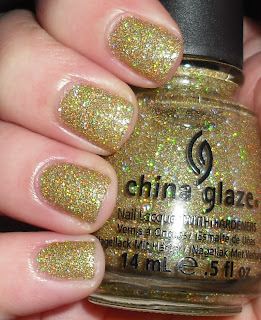 Ultamate Holiday is a gold with holographic glitter. I like it on you, though. It looks atrocious on me.. almost leans to more of a "baby food green." :( I dislike it mainly for the fact that it eats top coat like it's paid to. I have this, but haven't worn it. I actually really like it on you! The one I didn't manage to get is Fireside Glow. That one, I'm sketchy if it will look good on me since it's more red. I hate when I rush to get something and end up dissapointed. This doesn't look too bad though. Hopefully, it will get lots of love at its new location. I completely agree with you on this shade - it's in my give away box. I fell for the ltd and I don't have an Ulta for 450 miles of me to go and see. I ordered it from a blog sale along with 2 others from the Ulta ltd set. When they came, I thought, why did I fall for this from one blogger corresponding with me touting how great they were and they had good coverage and not too bumpy. the green this one has really is horrible. I snagged up all three of the polishes when I saw them at my Ulta. I like Mistletoe Me! and Fireside Glow more. But this is also a really lovely one. I like it more when I'm in the sun though.. lol.. Plus it's lovely for polish jewelry! I got this color also. It's a strange color, but I like it. I agree, it's a love it or hate it polish - no in between. New follower. love your stuff!